Meditations on a recent visit to the Metropolitan Museum of Art in New York City. Sherlock Holmes spars with a nasty cad who is trying to cajole a lovely young heiress into marriage in “The Adventure of the Illustrious Client.” One of the plot vehicles in this case is the fact that Baron Adelbert Gruner, the nasty cad, is also a famous collector of antique Chinese porcelain. He had even published an influential monograph on the topic. To successfully execute the case, Dr. Watson has to overnight assume the role of a porcelain connoisseur in order to, well, you’ll have to read the story. Suffice it to say that the hapless Watson is found out in short order. Hi-jinx ensue. Of course, such a fate would befall anyone given the task of becoming a porcelain “expert” in one night – even with the help of Wikipedia and Siri. The rarified environment of the high end antiques market is replete with extremely knowledgeable people for whom not just the history, but the provenance, market value, and current availability of highly desirable objects is of utmost concern. Without these collectors’ efforts there would be precious few museum collections for today’s poor struggling potters to visit in their own endless search for inspiration and edification. But let’s return to Baron Gruner. “A complex mind, all great criminals have that. Cool as ice, silky voiced, and poisonous as a cobra. He has breeding in him – a real aristocrat of crime, with a superficial suggestion of afternoon tea and all the cruelty of the grave behind it.” The wise old adage that ‘one should always except the present company’ is as relevant here as it is anywhere. And checks and balances have evolved over the years to keep transactions as clean as possible. Yet this spectacularly evocative description confronts us with a glimpse into a compromised and complicated issue. Regardless of today’s honest brokers and good intentions, the trade in expensive and rare antiques from exotic places ever evokes an ignoble, shadowy tinge of past grave digging, historical site despoiling, smuggling, and outright pillaging. But don’t take Sir Arthur Conan Doyle’s word for this. Just ask any of your archeology friends. The Complete Sherlock Holmes. Sir Arthur Conan Doyle. Garden City Books/New York. 1930. The Plundered Past. Karl Ernest Meyer. MacMillan Publishing Company/New York. 1977. All The Best Rubbish. Ivor Noel Hume. Harper/New York. 1974. Everybody knows the story of how Chinese blue and white porcelain thoroughly influenced world ceramic history. But we look at this story backwards, from its results. How did it look from the other direction, from it’s beginning? Mid 9th century Tang Dynasty grandees were repulsed by isolated southern Chinese potters’ gaudy color and decoration experiments. Anything other than green (replicating jade) or white (replicating silver) belonged in tombs. Far away Arabs instantly recognized that new work’s value. Shiploads of southern Chinese stoneware, mostly bowls, were sent to the Abbasid Caliphate in large re-useable ceramic jars. These jars had auspicious inscriptions, often in Arabic, scrawled along their outside. Arabic was the ‘official language’ of the entire trade network connecting southern China to the Persian Gulf and beyond. Arab potters noticed Chinese stoneware encroaching into their home market. They responded by inventing a smooth white tin glaze for their own earthenware. A world of color beyond somber Chinese greens and whites was now possible. Cobalt blue was the first new hue, followed by many others. Then someone in Basra invented lusterware, truly replicating copper and silver. The Arabs began signing their work. They also sent it back to China, along with Mesopotamian cobalt, to try this new look on white Chinese stoneware glazes. The first Chinese blue and white was probably painted by resident Persians. The Tang attitude seemed to be “fine, take the foreigners’ money- they actually like that vulgar stuff!” But so much money was made that people criticized the volume of trees wasted by this work, and all the new ‘art pottery’ for elite tea ceremonies. Whole mountainsides were deforested to feed the kilns. The growing impact of ‘aliens’ led to a vicious reaction, with widespread looting and killing of resident foreign traders. Colorful, decorated ceramics dried up. The incoming Song Dynasty reverted to safe, comfortable celadons and whites. The world had to wait another five hundred years for Persian traders to (again) ask Yuan Dynasty potters to put Mesopotamian cobalt on their new porcelain. ‘Blue and white’ as we now know it exploded onto the world stage, blossoming over the next three hundred years into pottery history’s single most recognized chapter. Back in the 9th century, Arab potters saw this tidal wave coming. Their response – tin glazes, cobalt blue, polychrome, and luster ware – set the whole story in motion. And they did all that in only 40 years. The M’ing Dynasty Chinese judged their export porcelain as purely 2nd rate fodder for a lower-browed European audience. And the European foreigners who gobbled up export porcelain were, to the M’ing, strange, impenetrable, exotic, dangerous aliens. But not all M’ing Chinese looked down on export ware, or those who bought it. Before East India Trade delegations became commonplace in Canton, Macao, and elsewhere, a few officials (a very few) collected export porcelain as expressions of those foreigners who were, to them, strange, exotic, impenetrable, curious aliens. Chinese export porcelain opened up a completely new world for 16th century Europeans. Entire industries were spawned to get more, and to make it cheaper themselves. Until that occurred, Europeans saw the foreign Chinese who made this wonderful work as strange, exotic, impenetrable, glamorous aliens. In the years since the China Trade, many scholars have understood the wider view that export porcelain indeed expressed European culture of the time as much as it did the capabilities of M’ing potters. Take, for example, a typical export item known as the klapmut. Both Chinese and Dutch used soup bowls. The Chinese drank thin broths right from the bowl. Dutch stews needed spoons. The narrow Chinese drinking rim didn’t allow resting space for spoons, so the Dutch directed Chinese potters to include a wide spoon rest rim: voila, the awkward sounding klapmut. Today’s elegant wide rimmed bowl began life as a foreign shape for Chinese potters – strange, exotic, impenetrable, unusual, and alien. Does any of this old history matter today? It’s nice, as a potter, to know why I make bowls with wide rims. Deeper historical analogies can be less satisfying because history never repeats itself perfectly. Witness the current fear-mongering and election year lunacy, fueled in part by masses of people fleeing violence in the Mid East and beyond. Europeans and Americans have sympathized with the refugees who bring with them only what they can carry and remember. But many now struggle with the growing vitriol swirling around these foreign, strange, exotic, impenetrable, desperate aliens. Vermeer’s Hat, The Seventeenth Century and the Dawn of the Global World. Timothy Brook. Bloomsbury Press/New York. 2008. The modern redware potter drives home from a show pondering crazy thoughts like “why am I doing all this,” and “does everything I do look backward?” (stylistically to earlier eras, financially to better shows, etc.) The redware potter is traveling the Used To Be Highway. Such a highway exists, of course, but not necessarily in the depressing way described above. Interpreting historical styles, like redware, falls solidly along a venerable continuum of reproductions, copies, and revivals (and fakes and forgeries) made since ancient times. Romans, fascinated by earlier Etruscan pottery, commissioned Etruscan style work for many of their lavish pavilions. Chinese potters copied older work to honor past masters. Medieval European artisans made historical reproductions for holy pilgrimage tourists. Copies of 16th century Siegburg stoneware, often from original 16th century molds, were popular during the late 19th century German Gothic revival. The nascent 19th century American tourist industry considered historical work a patriotic act. And maintaining traditional cultural expressions in the face of changing times has motivated artists throughout time. Blue and white pottery gets complicated. This idea went back and forth in so many ways across the globe that it almost resembles light. Is light (for example) a wave or a particle? Is Delft (for example) a copy or an original style? Then there’s fakes and forgeries. What appears to be simple malfeasance (and often is) can also be a complex issue. 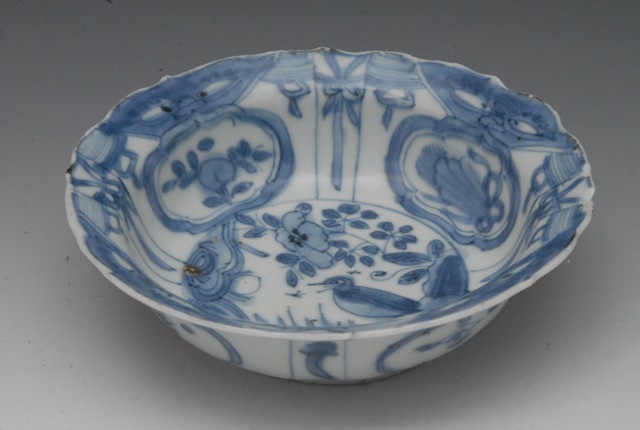 Was early Delftware a forgery? Are fakes worse than pilfered archeological sites? What of desperate families peddling fake artifacts in impoverished but historically significant areas, or the work of Ai Wei? Copying masterpieces was for centuries a principle method of arts instruction. Intense observational and technical skills are required, and honed, when studying historical artifacts in this way. A simple test illustrates this point: make two mugs, one which you thought up in your head, the other as an exact replica of someone else’s mug. Ask yourself afterwards which effort stretched your skills more? It’s tempting to draw some meaningful conclusion about why potters today might work within historical styles, given the array of available paths. (Or are these stylistic options just interpretations of a different sort?). But regardless of the route they took to get there, or the bumps along the way, many potters (and other artisans) who make historically based work will tell you – it’s just tremendously fun to do. Decorated Stoneware Pottery of North America. Donald Webster. Charles Tuttle Co./Rutland, VT. 1971. Dutch Pottery and Porcelain. Pitcairn Knowles. Scribner’s/New York. 1940. The Concise Encyclopedia of Continental Pottery and Porcelain. Reginald Haggar. Hawthorn Books/ New York. 1960.